So far, the Fan's Voice series has featured the Jaguars, the Broncos and the Packers. Today's installment is written by Chris Carlberg and it's all about the Buffalo Bills. The Buffalo Bills played the Cincinnati Bengals on Monday Night Football in October of 1991. I was 10 years old, and I was there. I watched Jim Kelly’s K-Gun offense dominate the Bengals. I listened, and joined in, as the 80,000 fans at Rich Stadium chanted “Norman, Norman” every time Boomer Esiason took the field. I learned that Norman was Boomer’s real first name, and I learned that we were screaming it as loud as we could so he couldn’t hear the plays and so his players couldn’t hear him. I also learned that sometimes intoxication looks like a red and blue painted, shirtless, 270-pound man with buffalo horns on his head. 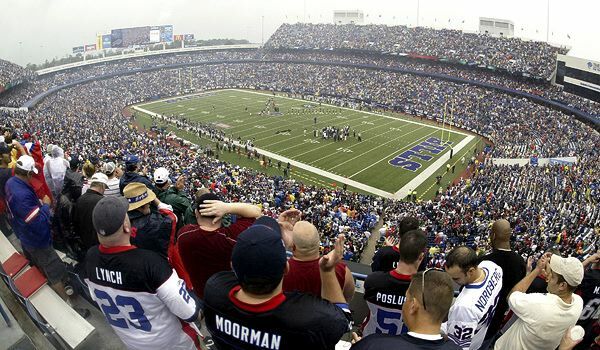 I have countless memories of Rich Stadium and watching the Buffalo Bills play football. The college-atmosphere of Orchard Park on game day, where the whole town stops what they’re doing on Sunday afternoons until the game is over and every front lawn in town turns into a makeshift parking lot. I watched with heartbreak from the front row as Deion returned a punt down the sideline. I watched Drew Bledsoe lead the Bills to a last-minute comeback win over the Dolphins in a snow storm, despite Ricky Williams 234 rushing yards. I remember watching #83 in awe as Andre Reed would grab another one in traffic over the middle and take it in for 6. I also remember running out of that same tunnel at Rich Stadium just like my favorite player, wearing #83 for the Maple Grove Red Dragons, on our way to a State Championship. I am, and always will be, a Buffalo Bills fan. It seems like the good old days are gone, and recent history says that I’m crazy to still root for this team. At times, its hard to disagree, but my allegiance runs deep, and no matter how hard it is to not be driven away by defeat and mediocrity and embarrassment, I refuse. Every year they beat me down and tell me to stop watching, stop reading, and stop cheering them on. But I press on because they are my team. And there are many Bills fans like me, though fewer and fewer each day it seems. As droves of young sports fans move south to avoid 6-month winters, unemployment and New York taxes, the ability to stay faithful to the team we love has become more and more daunting. 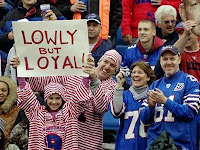 I also acknowledge that Bills fans are not alone in our plight. There are football fans all over the country that root for their awful teams, year after year, loss after loss. In many ways we are no different than the Browns fans or the Lions fans or the Raiders fans that watch or listen or follow their team each week with horrified disappointment. We all stand together, wondering how, in good conscience, we will be able to mold our young children into fans of our favorite teams. Do we really wish this upon them? Maybe we should just let them root for the Steelers or the Patriots … at least then they can know what winning feels like. No way. 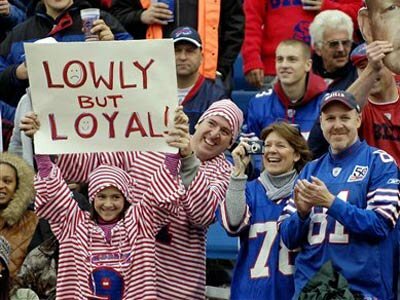 And even though Bills fans have much in common with the others, the Buffalo Bills have found a way to separate themselves from the rest. They not only lose on the field, but they’ve actually established for themselves a legacy of embarrassment and mediocrity and collapse. In the 1970’s the Bills drafted OJ Simpson who lead the Bills to playoffs and became one of the top running backs in NFL history. He is the only player to rush for more than 2,000 yards in a 14 game season, and when he retired he was the League’s 2nd all-time leading rusher. Then he killed people. Not exactly the name you want on your Wall of Fame. The 1980’s saw Bill Polian and Marv Levy build the Bills into a powerhouse as they signed and drafted Hall of Famers like Jim Kelly, Bruce Smith, Thurman Thomas, James Lofton, and Andre Reed. So the stage was set for the Bills to make history in the 90’s. And history they did make. The Buffalo Bills represented the AFC in 4 consecutive Super Bowls (1990-1993). They also made history by losing all 4 games by a combined 139-73, which begs the question: “Isn’t it better to have gotten there and lost than to never have gotten there?” The answer is no. Other than “Wide Right” in 1990, the Bills weren’t even competitive. They were embarrassed in front of the world over, and over, and over, and over. The 1999 season for the Bills was franchise-altering, and, as such, it is worth summarizing with a few bullet points: Doug Flutie started the first 15 games of the season, leading the Bills to a 10-5 record, clinching a playoff spot prior to week 16, and basically becoming a local hero and an inspiring underdog story for the sports nation. The final week of the season, Wade Phillips (who is terrible) rested his starters, including Flutie, and started Rob Johnson (who is terrible). Johnson played well, led the Bills to a win, and much to the horror of everyone who knows anything about sports, was named as the starting QB for the Wildcard Playoff game against the Tennessee Titans. With Flutie on the bench, the Bills new starter was 10 for 22 for 131 yards but remarkably had the Bills up by 1 point and in position to win with 16 seconds left in the game. 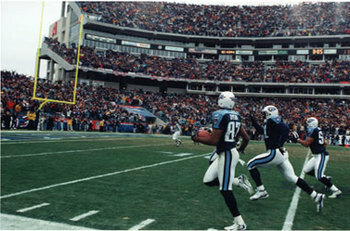 The next play was so unbelievable that it has its own title: “The Music City Miracle.” After a handoff and a cross-field lateral, the validity of which is controversial, the Bills kickoff was returned 75 yards for a touchdown. The Bills lost that game, cut Andre Reed, Bruce Smith, and Thurman Thomas (the last 3 players from the super bowl years), and haven’t made it back to the playoffs for the past 13 years, which is the longest drought in the NFL. The Browns and Raiders, both of whom are awful, have the second longest drought at 10 years. The Bills are 82-126 since 2000 and have burned through 7 coaches during that same time period, each one seemingly more inept than the one before. They haven’t had a winning season since 2004, and have been last in their division since 2008. They also find a way to make themselves the laughing stock of the NFL Draft each year, baffling experts and analysts and wasting their top-10 draft picks on 3rd rounders like JP Losman and EJ Manuel. The numbers are staggering and sad. Sometimes its hard to remember why you cheer for a team like the Bills … a team that hardly resembles the team you grew up idolizing. But if you look carefully, you can actually see Jim Kelly behind the bench at all the Bills home games, running up and down the sideline waving a towel and cheering for his team. If he hasn’t lost hope, neither will I. That is why I am and always will be a Bills fan. If Chris Carlberg's name sounds familiar to you, it's because this is not his first appearance on Banshee Sports. 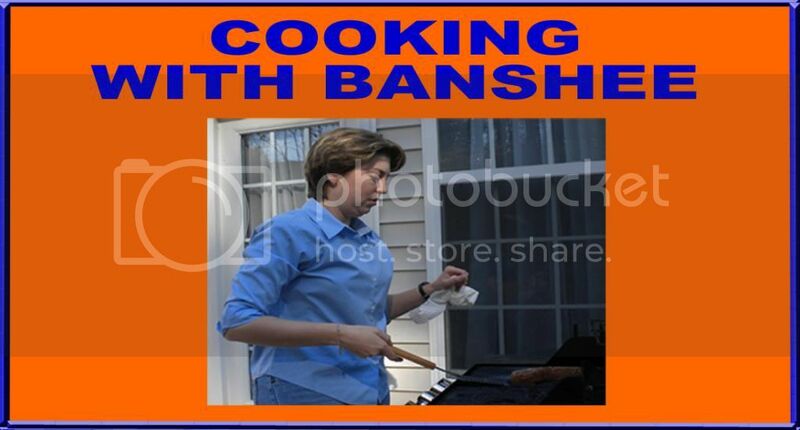 Chris was the winner of the inaugural Banshee Sports Bracket Bonanza. When Chris isn't watching the Bills or winning prizes from me, he is a sales consultant for DePuy Synthes in their spinal division. Nowadays, Chris mostly watches his Bills on television since he and his growing family are located in Concord, NC.